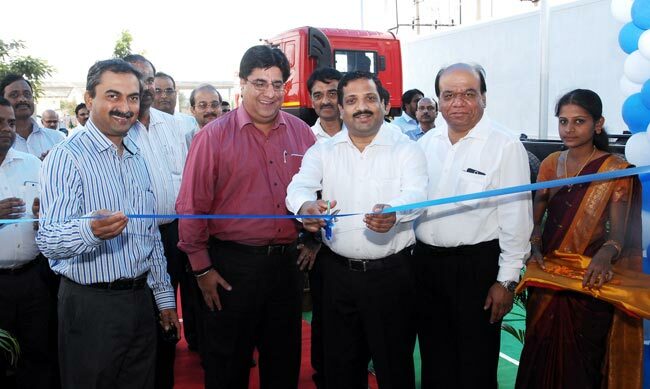 Tata Motors India’s largest commercial vehicle manufacturer, today inaugurated a new dealership with Prerana Motors Regio, by establishing a state-of-the-art commercial vehicle 3S facility in Tumkur, providing customers with a complete experience of Sales, Service and Spares, all under one roof. Two more 3S facilities are developed in Davangere and Chitradurga, with each of these facilities strategically located, ably managed by highly trained manpower and sophisticated tools and equipment for faster turnaround. While the Tumkur facility is spread over 6,800 Square Meters, the facility in Davangere is spread over 7,500 Square Meters, with the yet to be opened Chitradurga facility, being 4,000 Square Meters. With an aggressive plan, we at Tata Motors are delighted to partner Prerana Motors Regio to ensure a robust and comprehensive experience for our customers here in Karnataka, ably supported by three new 3S facilities. Through initiatives like this, we hope to proactively take steps, for better delivery of our products and services, not only in Karnataka, but across the country, based on Tata Motors customer centric approach of better anticipating customer requirements. With well-planned facilities, complementing an unmatched commercial vehicles range, we are better placed at building strong, lasting relationships with our customers. Having been associated with Tata Motors for over 25 years, we at Prerana Motors are happy to extend our partnership with the opening of three more state-of-the-art facilities here in Karnataka. With a staff of over 1600 people, operating from over 70 locations, we at Prerana Motors are geared-up to offer all-inclusive services of sales, after-sales and spare parts, all under one roof, with highly trained personnel, ensuring superior levels of customer service. With these new introductions, we hope to grow the Tata Motors brand name here, ensuring effective services for the ever discerning customer. Having recently celebrated 60 years of truck manufacturing at its first manufacturing and engineering facility in Jamshedpur, Tata Motors is the leader in the Indian commercial vehicle space, with the most comprehensive line-up of commercial vehicles, ranging from the 0.5 tonne Magic Iris and Ace Zip to the 49 tonne PRIMA Heavy Commercial Vehicle, including a defence range. This new showroom in Tumkur, offers a contemporary-styled, single-point hub for Sales, Service and Spare Parts and is spacious, for a comfortable buying experience. The service facility can attend up to 50 vehicles a day, with about 22 bays. At this new dealership, customers can also avail of Tata Motors innovative service offerings for its medium & heavy commercial vehicle range like Tata Alert, Tata Fleetman, Triple Benefit Insurance, Tata Motors 4 year warranty and Extended Service Intervals. Furthermore customers can also avail of financing options, loyalty programs, including full service contracts for an enhanced service experience. The dealership is equipped with mobile workshops for 24X7 customer support. To ensure best service experience, the entire sales team at these new facilities is be trained under Tata Motors coveted DRONA training module, which comprises of rich training content rendered by specialists.